Concise, informative, and well-written course handbooks are among the most effective tools teachers – band directors in particular – have at their disposal. Directors have a chance to put, in writing, their goals for the year, expectations of student behavior and parent involvement, grading scales, attendance policies, and even the disciplinary consequences of any infraction of the rules. By including a form for students and parents to sign and return upon review of the handbook, teachers can treat this written acknowledgment like a contract, which will help to alleviate misunderstandings and resolve conflicts. While the task of writing such a hefty, detailed document can seem daunting, organizing the information into smaller sections helps both readers and the writer. First things first. An introductory paragraph on the history of the band program, including recent accomplishments and goals for the future, often helps readers ease into the dry but informative prose that inevitably follows. Many directors like to include their bios in this opening section as well, as a way to introduce themselves to students and parents alike. Start with the basics. It helps to list faculty members? names and contact information toward the front of the handbook, as well as building hours, policies on using practice rooms and rehearsal facilities, and procedures for borrowing a school instrument or checking out a locker. Directors could also feasibly list acceptable and unacceptable examples of concert attire or marching uniforms in this section, or perhaps list any course materials that need to be purchased. This makes it easy to find important phone numbers and other necessary information. Break it down. Incoming students may not know about all the different ensembles in which they could potentially participate. Taking the time to mention additional playing opportunities in jazz bands, pep bands, pit orchestras, or chamber ensembles helps generate interest and increase participation in these groups. If any of the ensembles have audition requirements, challenge systems, or other prerequisites (i.e., students who audition for the top concert band must be taking private lessons; double reed players must play a secondary instrument or participate in the color guard during the marching season) this is a good place to list them. Save the date. Parades, district and state festivals, football games, and even most school concerts are set months in advance; include a tentative calendar in the handbook with as many events as possible to help prevent scheduling conflicts and to give students and parents an idea of the time commitment involved. Directors should also mention summer band camps, band trips, or other substantial commitments up front, even if these activities are not yet set in stone. It?s far easier to cancel a trip than it is to try and add one after the school year has started. Make the grade. The section on grading could describe the method used to figure grades, a break-down of typical semester activities showing how heavily each affects the final grade, and perhaps even suggestions for extra-credit points. If the final grade reflects other areas, such as rehearsal attendance, weekly practice logs, or performance requirements, it helps to spell out these expectations as well. Lay down the law, then stick to your guns. List the class rules along with the steps taken to resolve any disciplinary issues that may arise. Many directors choose to post these rules in the classroom, but this way, parents will also know what is expected of their children, and the consequences for poor conduct will come as less of a surprise. Clearly stated expectations, coupled with a consistent course of action are the best ways to keep discipline problems at bay. Tie up the loose ends. Include any other necessary information, that was not previously covered, in a miscellaneous section toward the end of the handbook, such as year-end awards, varsity letters, pizza parties, etc. Parents also appreciate a written invitation to contact the director with their questions or concerns about the topics covered in the handbook; it often puts them at ease knowing their child’s instructor welcomes their input. Because it is so easy to get bogged down in the details, take extra care when editing the handbook. There is no need for scholarly prose or, at times, even structured paragraphs. Often, limiting the word count or writing the handbook in outline form helps keep your thoughts clear and the ideas succinct. If you divide the document into sections, separate each with a clear sub-heading. When making revisions, be on the lookout for lengthy or compound sentences in particular; there is almost always a more concise way to state or define a complex idea, even if it involves breaking the idea down into two or more parts. Once everything is in writing, you may discover a better way to organize the document after a thorough read-through. For example, if the summer band trip is mentioned in four different sections of the handbook, these sentences should probably be moved and grouped under a separate heading that is devoted entirely to the trip. Also, try to avoid putting certain words within a sentence in bold, italicized, or capital letters, even if it is just for clarity or emphasis. While this certainly gets the point across, many people consider this approach to be demeaning or condescending in nature. The exact content of class handbooks will undoubtedly vary; it is up to directors to determine which course requirements and expectations are appropriate for their band and, based on enrollment numbers and students? abilities, this may vary from year to year. I know some teachers whose grading policy mandates that the only way for students to earn an A in their class is by taking private lessons. While this approach has been working quite well at the schools in question, other teachers within the same district feel it would be ludicrous to impose this requirement on their students. In another district, one director requires every student to participate in their annual solo and ensemble contest, while another only mentions the contest to students who show a genuine interest in performing. The first handbook that teachers make will undoubtedly be the hardest to write; once directors organize their thoughts and put their policies in writing, subsequent editions of the handbook should only need minor adjustments. Even if directors switch schools or change grade levels, while the school policies may differ, it is unlikely that their basic expectations will change. 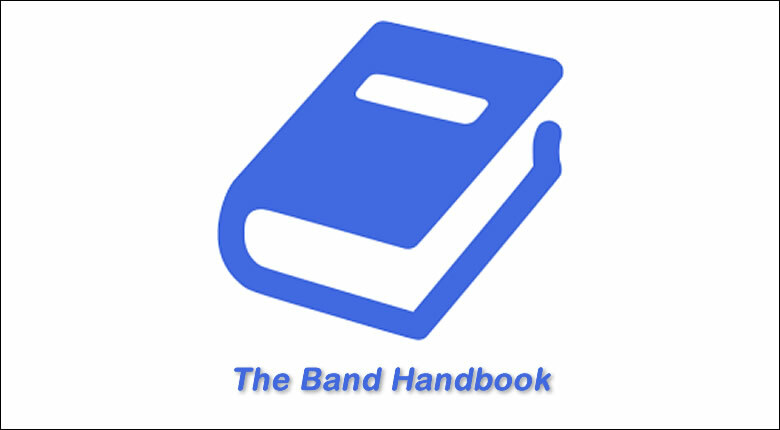 Regardless of length or content, if students and parents can read, understand, and agree to the terms outlined within, then the handbook will aid directors in running a successful music program. Jamey Aebersold Presents: Notable Product Upgrades!